Your home isn't just a place where you eat and sleep - it's also where you relax, have fun and enjoy the company of family and friends. So it's understandable that you want to do everything you can to keep it as comfortable and clean as possible. But, do you know the quality of the air inside our home is often worse that it is outside, even if your home is spotless? Cold drafts may have you reaching for your sweater a little too often. You and your spouse may be constantly adjusting the thermostat because you're each comfortable at different temperature. ​A loud furnace may have you dreaming about putting a "For Sale" sign up. 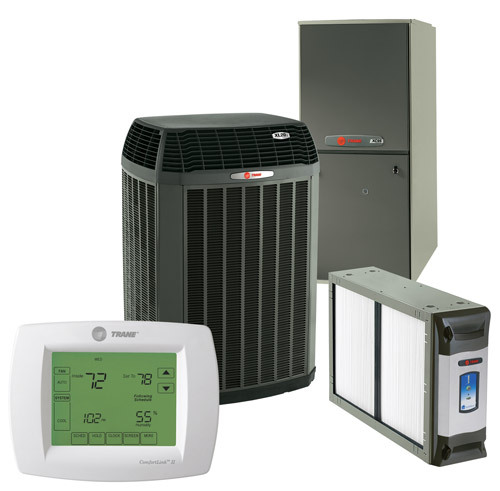 A high-performance, precision-engineered Trane heating and cooling system can solve these problems and more, while making your home feel incredibly comfortable - all day, all night, all year and for years to come. From small unitary packaged units to 3,950-ton water chillers. From custom air handlers to variable-air-volume terminals and packaged terminal air conditioners, Trane has the right equipment and controls for any kind of job, in any climate, in any situation, anywhere in the world. ​And using our deep understanding of HVAC applications, we can orchestrate these pieces into reliable and energy-efficient Integrated Comfort systems (ICS) engineered systems designed to meet or exceed your thermal comfort needs.